Daldorado’s SILENTFlow™ grating system is the next evolution in parallel grating— with features that surpass any other commercial grating currently sold in the US. All grating features the highest flow rate ~ with an unprecedented 40% open area and whisper quiet noise reduction. Perpendicular grating is by far the most popular for deck-drain gutter systems. But did you know that the IBC standard for Child Finger/Toe Entanglement requires a gap opening of no more than 8mm? Daldorado grating meets these IBC guidelines and more to help avoid small fingers and toes from getting hurt. Stone and tile add natural beauty and timeless elegance and is prized for its strength and durability. With the Daldorado DalLUXTM stone and tile support grate system, designers can take their decking to the next level by bringing the deck to the water’s edge for superior aesthetics and functionality. Introducing the Daldorado DalMax™ series of Sump and Grate for new construction, and replacement Frame and Grate for 18”x36” and 18”x54” unblockable large area main drains. The DalMax™ series is certified to APSP-16 Standards by IAPMO, and NSF certified for material composition. The Daldorado Deck Drain System takes deck drains to the next level with robust features not found with any other drain systems. With a 40% open area, Daldorado Drain Packages meet or exceed IBC Standards for finger/toe entrapment guidelines with a gap opening of only 8mm, slip resistant and superior strength to withstand light vehicle traffic. Each package comes complete in 10' lengths and 4” widths, and include a heavy-duty base with a throw-away cap to keep its form when pouring and setting concrete. This system has everything you need to do the job right. Daldorado weirs for the walls of lazy rivers are available custom sized— straight or radius. Available for floor and wall, complies with IBC's Child Finger/ Toe Entrapment featuring 8 mm flow slots. Complete your grating system with Daldorado curb angles for a clean finished line. 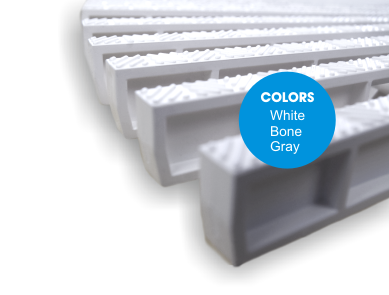 Our curb angles give you the edge you need for setting tile or deck finishing. Manufactured from the highest-quality PVC, Daldorado’s hand holds not only give pools a finished edge, but they also provide added safety by giving swimmers the extra grip they need to hold onto the pool edge.